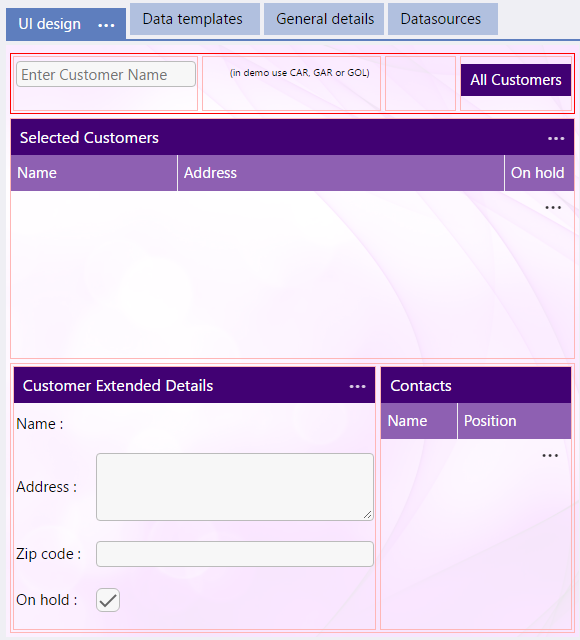 The Adjust (Segment Management) area is where you can add, remove, clone or adjust segments on a Page of the app UI design. The example screen on the right has used the "bordered mode" option in the "UI Design" tab header to show all the segments on this screen bordered in red. These Segments are then structured, in the General tab to be either single entity data segments, datagrids (multi-entity data segments), images, blank or custom segments. 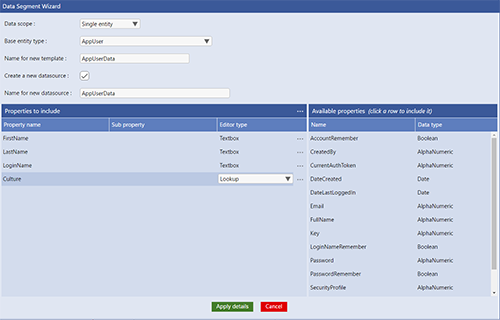 The content of the segment is defined in a Template which defines the data fields to display and the Widgets used for each item. Finally, each Segment can be bound to a Data Source which can be populated with the data that will be displayed, updated, etc by the Widget when the app is used. 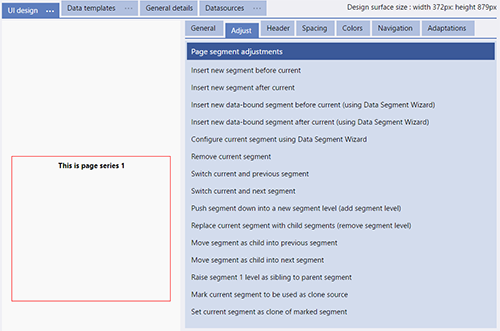 The Data Segment Wizard provides a simple and structured way to configure a new or existing Data Segment in your UI design. 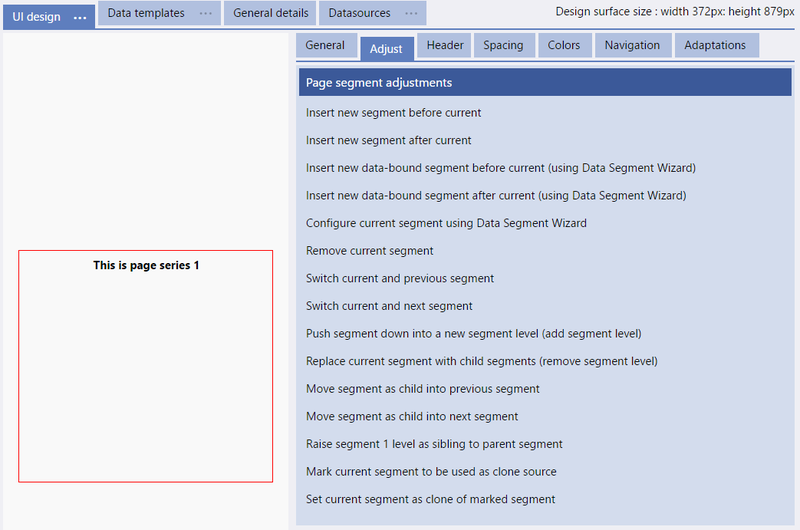 Use the Wizard Screen, shown on the right, to set the segment to single or multi entity (single data or data grid) and then select or create a template and datasource to define the structure of the segment and then source of the data elements. 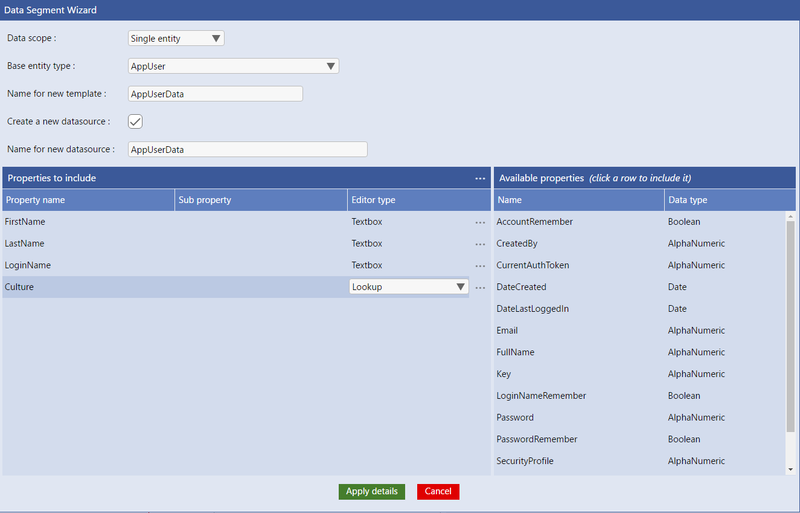 The ellipsys menu items allow you to quick set all the selected properties to have a "label" or "Displaybox" editor type or to change the order of the properties to be displayed (nudge up or nudge down). 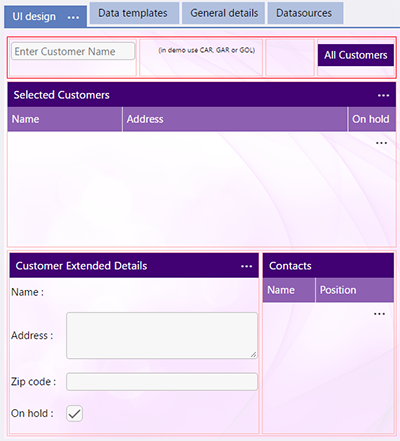 Applying the details using "Apply Details" button will take you back to the UI design screen with all the basic components of the segment set up.